Has sailing a kayak with KajakOle’s guides taken you by storm? Then help is available. Buy your own sea kayak or inflatable kayak so you can go on your own trips and experience the joy of paddling. Havkajakvej 2, 2300 Kbh. 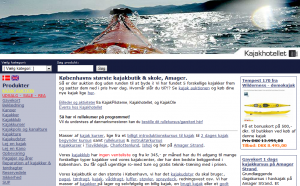 S.
Kayak trips – your next holiday in your kayak in Venice or on Greenland.